Antarctica’s fastest-melting glacier had an iceberg break off more than two months ago. That iceberg—around 100 square miles—disintegrated into several smaller icebergs in a pattern scientists did not expect. An animation using satellite images of the iceberg reveals that the iceberg likely got stuck by thick sea ice before it disintegrated into smaller icebergs. Previously, scientists expected the iceberg to drift far out into the ocean before breaking up. 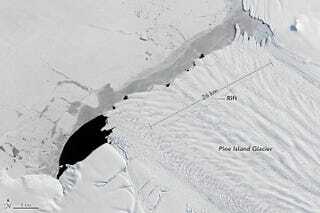 The iceberg calved from Pine Island Glacier in West Antarctica back in September. The calving event followed a different pattern than is typical of calving events, and scientists attribute the difference to thinning ice over the past few decades. Pine Island Glacier—from which the most recently disintegrated iceberg calved from—is the fastest-melting glacier in Antarctica. It is responsible for a quarter of ice loss on Antarctica—shedding 45 billion tons of ice each year. Other iceberg calving events occurred in 2001, 2007 and 2013. The pattern change signals that crevasses in the ice shelf have an increasing influence on how the icebergs break off. Although the ice shelf has been thinning for decades, there has been no systematic retreat of the ice front until now. “If the ice shelf continues to thin and the ice front continues to retreat, its buttressing effect on [Pine Island Glacier] will diminish, which is likely to lead to further dynamic thinning and retreat of the glacier,” Larter explained in the statement. This glacier contributes to more sea level rise than any Antarctica glacier, and there are concerns that there will be “runaway retreat,” in which the glacier melts much more quickly than expected, causing a larger contribution to sea levels than anticipated.